PRIDE isn't just a day or a march, it's an attitude! And we're displaying our PRIDE with an entire week of fun activities. Join us at the Center at 4pm and start the celebration early! Rainbow colors for everyone! 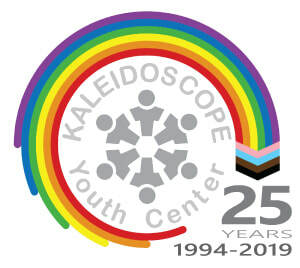 Tie-dye your own KYC Pride t-shirt for the parade on Saturday! Shhh... don't tell anyone, but KYC has a surprise dance in the works to wow the parade crowd. Join us to learn the moves! KYC is happy to be teaming up with Stonewall Community Center and several youth leaders to create a festival space just for young people ages 12-20. The teen village will feature live performances, resource tables, and a dance party. Check back soon for a full schedule. The PRIDE Parade is the marquee event of the weekend. KYC invites all young people ages 12-20, including GSAs, to march with us and demonstrate the power of YOUTH! A limited number of FREE KYC t-shirts will be available for marchers. Email Brandon to sign up today! Parade line-up will take place on Front St., south of Broad St. KYC will be meeting at the giant gavel (pictured below) near the intersection of Front St. and State St. between 9am and 10am. Don't be late! After the parade, join us at the Teen Village for lunch (catered by Donatos) and entertainment. 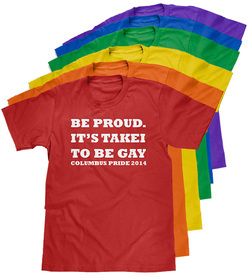 Wear your PRIDE for all to see in this great tee designed by local shop Outfit/Good. The best part? $7 from the sale of each shirt benefits KYC! It's "Takei" to be a giver, too!